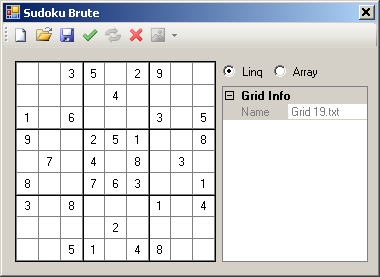 The brute force algorithm is "dumb" method of solving a sudoku puzzle: it sequentially tries a potential solution for an unsolved cell and then moves onto the next and attempts to find a solution for that cell, and upon finding one will move onto the next and if a solution is not found, it steps back to the previous solved cell, selects a new solution and moves onto the next again. By doing this over and over, it can be guaranteed to find a solution for any valid sudoku puzzle. However, this can be time consuming with some of the more complex puzzles taking several minutes to solve. 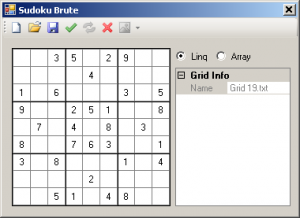 I have written a C# application which implements the?brute-force algorithm?to solve Sudoku puzzles. It's written using .Net 3.5 in Visual Studio 2008, and offers two different implementations of the brute-force algorithm - one uses arrays to hold data and the other using Linq to manipulate classes which hold data. ?Practically, they both use the same algorithm, just different methods of implementation. From my limited testing, they both take the same time to produce a solution for any grid; the inclusion of both was just me trying different technologies. The app is pictured below and?comes with fifty examples and allows one to add and save sudoku grids, and modify existing ones. To view an animated gif of the brute in action click here. Display screen updates - selecting yes will display the solution process in real time. Selecting this option will slow down the solution process. In addition, there are two radio buttons allowing one to select the solution class - either a Linq or array based method. To download the executable and sample solutions, click here. To download the source files and solutions, click here. To view the source code and run it, you'll need Microsoft Visual Studio which you can find here. Use the above code at your own risk, and I accept no liability for any harm that may come to their computer. This is a link to an excellent article about the classes available for managing object collections. Unique - store only unique values. Mask - store combinations that match the provided pattern; an underscore represents a wildcard. Defaults to a length of underscores equal to the combination source string. CombinationLength - the length of the combination to be produced; defaults to the length of the combination source string. The class is displayed below, and it's usage is simple. Mask and combination usage is equally simple. Here is the class. Copy and paste into into a new class in visual studio. /// a mask, storing unique values and length of combination to be produced. /// Store unique values only. If true, will slow down the generation. /// If specified, only match patterns that match. //that value, and pass into the function. A simple bubble sort which arranges the provided array of numbers from smallest to largest. Have you ever been frustated by the ToolTip component's lack of functionality,??i.e. you't can add a close button like?the NotifyIcon control, lack of handleable events? Be frustated no more, as a solution is at hand. The Balloon Window for .Net will is a handy addon that offers all the functionality of the NotifyIcon control AND the ToolTip in a handy package. A perplexing problem with FCKEditor solved…. A perplexing problem I encountered with FCKEditor 2.6.3 was solved with the help of the internet. Well fancy that! Rather than recount my own problems, I'll use the words of others who encountered the same problem and paste, slightly reformat and present them, verbatim, below. i have sucessfully implemented the editor into my .net application (vb.net) the editor works fine and configured how i wanted it, only isusse is when you go and click on the image uploader and then go to the upload tab, select the file and then click the "send it to server" button it comes up with the status bar and just hangs and does nothing. it does not upload the file all it does is show the status bar and does not move of it. Any Sugguestions, i have altered the config.ascx file and also the fckconfig file and i belive i have pointed it to the correct file location see bellow for config.ascx and fckconfig. For those who have the issue where the image upload dialog uploads the image BUT the dialog hangs or stays open...here is what I did to fix it. Compile the project and then reference the new dll file in your project. This worked for me and I hope it helps you. The upload dialog now works on my dev XP and on the Windows Server 2003 website. The above text was taken from here. // Get an Hicon for myBitmap. // Create a new icon from the handle.